Some of my favorite items in our family history holdings are those things that were never meant to be saved, never meant to tell a story or be passed on, never meant to be heirlooms, so to speak. However, many items of ephemera DO contribute (sometimes significantly) to our family stories, and sometimes they even create their OWN stories, as they might be the only evidence of these happenings in our ancestors' lives. "Things that exist or are used or enjoyed for only a short time"
Using ephemera to introduce or enhance kids' understanding of family history is a great idea for a few reasons. By its nature, ephemera is very visual and hands-on; this is so important in order to keep their attention and interest. Even in our digital society, paper ephemera is still a part of our everyday lives, so kids will automatically understand what it is. And, my favorite reason to introduce kids to ephemera is that it is, to some degree, open-ended in its story and requires a child or teen to use analytical skills to piece together the item's meaning and significance. ​When examining ephemera with child(ren), make it a game. Search for clues, maybe even using a magnifying glass to play out the part (much like we did for our Directory Detectives activity). 2.) Is the item dated? If yes, how old was your ancestor at the time? 3.) Is it from a particular event, place, or time period in your ancestor's life? How could you learn more about that event, place, or time period? 4.) If a ticket stub or receipt, is there a price listed? If yes, try to figure out how much the same event or item would cost today. 5.) Why do you think your family member saved this? 6.) What types of ephemera would YOU save to help future generations know more about your life? If your child is willing, encourage them to start collecting personal ephemera of their own, from places or events that are special and memorable to them. All you need is a three-ring binder and some acid-free, archival-quality clear sleeves. Or, if they are more technologically inclined, perhaps they will want to digitized their memorable ephemera and maybe even create their own personal digital scrapbook website online. You will find that some kids (especially younger ones) will want to save everything - and this is an opportunity to convey to them the idea that you CAN'T save everything. We need to be selective about what we save. We need to choose ephemera from times or events or places that really mean a lot to us and that contribute to our own stories and family stories. There is an art to saving ephemera, and, if done right, it can add SO much to our family history without over-burdening future generations. Encourage kids and teens to help YOU or other family historians sort through and digitize the ephemera left by previous generations. Did great-grandma leave behind a box full of funeral cards? Have the kids put them in chronological and/or alphabetical order. Are all those old letters folded in halves or thirds? Have the kids help smooth them out before digitizing. There are lots of ways to give kids first-hand experience in the process of archiving family history. Also, let kids help you FIND new sources of ephemera that may have meaning to your family. Believe it or not, Ebay is a great place to look for pieces of family history ephemera - I've found old matchbooks from family businesses and postcards depicting long-gone buildings that played a role in my family's history. The Digital Public Library of America, as well as other state historical digital collections, are also great places to search for family ephemera. 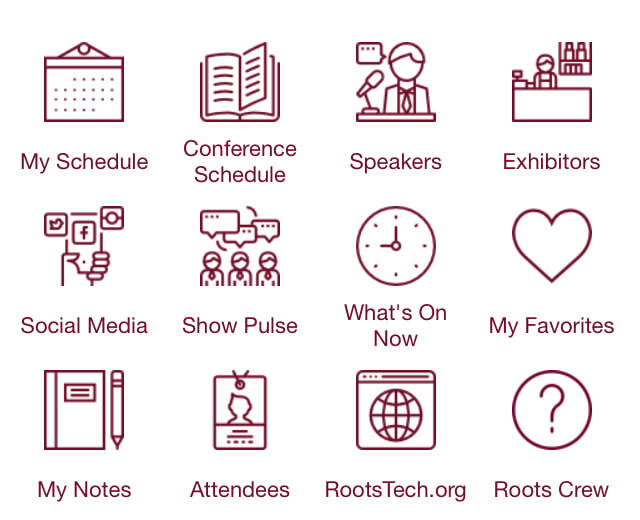 RootsTech 2019 is a wrap! I have lots to share about my experience at this awesome conference. I do intend on writing a blog post outlining some of my favorite sessions, but there is one session I attended that was so impactful to me that it deserves its own blog post. 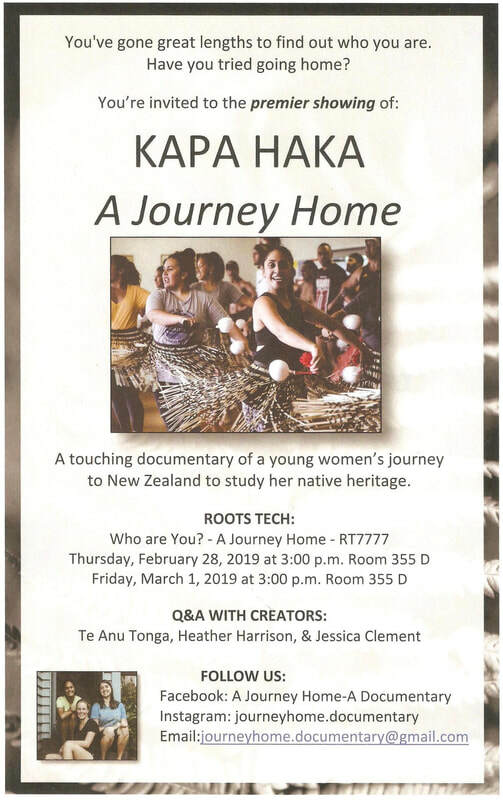 The session consisted of the showing of a documentary entitled 'Kapa Haka: A Journey Home,' and afterward there was a question/answer session with the three young women who made the film. As I sit here now, I struggle to put into words the range of emotions I felt while watching this documentary. It was an experience of the heart. I will, however, attempt to summarize some of the main themes expressed in the film and how so much of it relates to genealogy. As the pamphlet says, this film follows a young Māori/Tongan woman who returns to New Zealand for the first time since she was five years old (after growing up in the U.S.) The interviews with her were real and raw, and through her range of emotions, we are shown just how complex it can be to go back to a place and a culture that is a part of who you are, but one that you haven't been immersed in for most of your life. "The work of a kapa haka consists of the performance of a suite of songs and dances spanning several types of Māori music and dance, strung together into a coherent whole." The film teaches us about the kapa haka (and its cultural meanings) by chronicling the work high school students do to prepare for the annual Polyfest competition. For pretty much the entire film, I was simply in AWE of these teens' talent, work ethic, passion, and respect for their culture and the people who came before them. Several of the teens are interviewed, and just hearing them speak of 'lifting up my culture,' 'connecting with my culture,' and singing so beautifully in a language that was in danger of dying out just a few decades ago left me, as a viewer, with such a deep admiration of these young people and of the way in which they are carrying on their ancestors' traditions. Here is a very short video from NPR that gives you a sense of kapa haka. In Maori culture, a pepeha is a way of formally introducing yourself to another person. That introduction is formulated in a way that tells others how you are connected to place and to other people. It not only includes a bit of your 'whakapapa' (genealogy), but it also includes landforms, such as mountains, rivers, and other bodies of water, from your place of origin or those with which you personally identify. ​There is no English word to convey this 'genealogy to the land' concept, but it is something that I have felt for a long time. About 20 years ago, I left my home, the place where I grew up, the place in which all of my ancestors had lived since they left their European homelands and immigrated to America. My husband and I lived in four different states in that time I was gone, and there was no place in which I really felt at home. In fact, I had a running joke going with my husband, in which I would just say to him, "Don't bury me here." It wasn't really a morbid thing; it was me going to local cemeteries all the time, and just not being able to imagine myself (even my postmortem self) away from my ancestors. Since moving back to my Home, I've felt much more of a peace that I never felt in any of the other places we've lived. I have a connection to the physical land. There is a really neat app called 'Pepeha' that you can download for free. It explains more about pepeha and helps you to create a visual of your own pepeha! Click HERE to learn more. Ta Moko refers to traditional Maori tattooing. I learned from this film that these tattoos have incredible cultural AND familial significance. One of the teens in the film talked about her ta moko tattoo and about how each little design represented one of her family members. Another gentleman with full-face tattoo designs mentioned that every time he looks in the mirror, he is looking at his genealogy, his ancestors. I learned so much from this film and it just makes me want to connect more deeply with my cultural heritage - the heritage that my people developed over hundreds of years BEFORE they came to America. After the viewing of the film, all of us in the audience were wondering where we could buy a copy. The three young women who made this film mentioned that they are still working on how to possibly distribute it, but encouraged us to follow their social media accounts (listed on that pamphlet above) to get updates and I hope you will do the same. My 8-year-old daughter is really, really into playing board games right now, so that has made me think a little bit more about how I might be able to adapt popular board games into family history games. So, today's post is about a way in which to create a family history Pictionary-type game. This is NOT an original idea of mine; I've seen it mentioned on other family history websites, most recently this one at The Family History Guide. This blog post is just my individual take on the idea, so I hope you find it helpful. For those of you who have never played Pictionary, it is a very simple, easy-to-play game in which a person attempts to get their teammate(s) to guess a something based on the pictures he/she draws. The team only has a limited amount of time in which to guess what the illustrator is drawing, and no numbers or letters are allowed in drawings. The commercial version of Pictionary comes with a board on which each team moves game pieces around, but that's really not necessary in the simplest form of the game. All you need is at least two teams, a pencil and pad of paper, a way to keep time, and cards each illustrator must blindly choose from to know what to draw. Before you begin, decide on how many rounds you will play, and the team with the most correct guesses wins! What goes on the cards? This is where we can tailor the game to fit our own family history. Below, I will list some ideas for different categories and different things that you can put on the cards for people to draw. Just like in real Pictionary, you will find that some words turn out to be more difficult to draw and guess than others. When playing with kids, I recommend making sure they are on teams with other adults, and allowing those adults to "coach" them if they have questions about how to draw a particular clue. Using Microsoft Publisher, I've created some basic, customizable, cards that you can fill in to create your own family history Pictionary game. I've done a few sample ones based on my own family history to give you an idea of how they work. On the top of the card is the word or phrase that must be drawn and guessed. 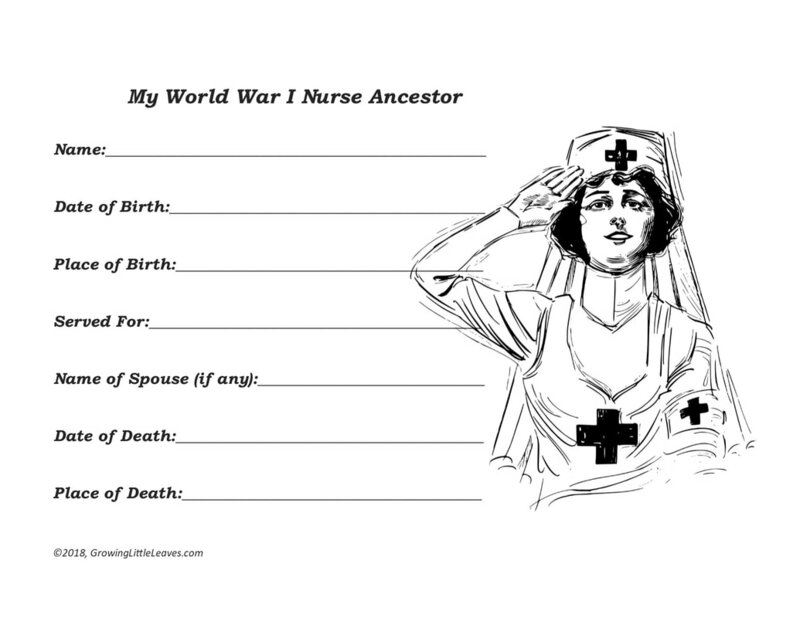 On the bottom of the card is a small space where you can write HOW that relates to your family history. So, after time has expired, and whether or not the team has properly guessed the word/phrase, you can read that short sentence to the entire group and learn some facts about your family history and ancestors. These facts could pertain to life-changing events in your ancestors' lives, or more simple things like hobbies, games, or foods they enjoyed. So, please feel free to download this file below. You will need Microsoft Publisher to open and edit it. All of the cards are blank and ready to be edited by you. (You can also change size and type of font, if you want to.) Once you have your cards written and printed, I do recommend that you laminate them for durability. This would be a great game to play at any family reunion or other larger family gathering. We are fortunate to live in a time when it is incredibly easy to document our lives. We can use our smartphones for photos, videos, audio recordings, and even speech-to-text dictation of our memories. However, how much is too much? Do your descendants really need thousands of photos and videos of your family? Though it hasn't been talked about much yet within the genealogical community, I think in the very near future, there will be discussions surrounding this kind of family history overload that might cause our descendants more strife than joy. Recently, I went through my kids' baby and toddler digital photo files, and ended up deleting a fair number of them. Many were repeats of the same event or scene and a lot were just not great quality photos. I want my kids and their descendants to be happy to have quality photos that tell our family story, but not so overwhelmed at the quantity of files (or memory those files take up) that they simply ignore them because they don't think they have the time. I can't tell you how many moms I've known who have had at least one panic attack when the phone or hard drive on which their family photos were stored just up and dies. The recommended rule is to have files that you care about in at least three separate places, in at least two different formats, with one backup location off-site. Update your backups at least once a month; many people do it on the first of each month, but whenever you choose to do it, set up a reminder in your calendar so that you don't forget. (Many off-site backup services, like Backblaze, will do your hard drive backup automatically, so you don't even have to think about it.) I know it's hard when your family is young and money is tight, but that $5 a month I spend on a back-up service is SO worth it, just for my peace of mind, knowing my family's memories are safe. I also recommend that you make an effort to regularly get your photos and videos off of your phone and/or tablet and into a more permanent and safe digital location. (Again, set a monthly or bi-monthly reminder.) Making physical photo books is great, and fun for even the youngest family members to enjoy, but don't let that be your only "insurance" location. There are some really great apps these days, like Chatbooks, Resnap, and Groovebook, that will easily generate and order photo books for you from the photos and social media apps on your phone. It's hard to worry about documenting your own experiences and emotions when you're running on coffee day after day just trying to keep the little ones clean, rested, and fed. But I'm here to tell you how important it is to do so, because so many of the experiences and feelings of early motherhood, which are SO precious and SO personal, are fleeting moments, and you may not remember all the details down the road. And, again, there are some wonderful, easy-to-use, daily journaling apps that make it so easy these days to document your daily mom-kid adventures. The older people in our families are so important to our family histories that we need to cultivate strong intergenerational relationships with them, and we need to model behavior to our young ones that teaches them to cherish the older ones' experiences and memories. Part of building these intergenerational relationships is making the effort to BE at extended family gatherings, which can be SO hard when you have very young children AND live away from everyone else. Driving in the car for hours on end with babies and toddlers is awful. My husband and I did it so many times through the years, but, looking back, it was SO worth it. During my son's first Christmas, he was only about a month old, didn't sleep well, and didn't eat well, which meant I was terribly tired all the time. We could have easily told family members we weren't making the long drive home for Christmas, and they would have understood. But we went anyway, and I'm so glad we did because I just love the photos of my son's first Christmas with my extended family members. Here he is meeting his great-great-aunt, who was a bit of a surrogate grandmother to me and my cousins, since her sister passed away at a fairly young age. I look at this photo now, and my great-aunt has since passed away, but here is this moment in time when my descendant met a woman whose parents bravely left their homeland of Poland to start a new life in America. So, when you go to family gatherings with your young children, take photos, even if the older people don't want you to, because someday you will cherish those moments in your children's lives and in your family's history. As careers end and children grow up, many of our older family members can get lonely and think that the younger and busier people in their lives have forgotten about them. There are small things we can do to let them know we are thinking of them, even if we live far away. I love sending greeting cards to people. It's super-easy to program your phone calendar to remind you of family birthdays and anniversaries, or just sending a 'Thinking of You' card at any time of the year is a great idea, too. Ever since they were toddlers, I have always asked my kids to draw a little picture or scribble their names in the cards we send, and I usually include photos, too. I still have an email from my husband's now-deceased 90-year-old grandmother, in which she thanked me for an Easter card we sent her with my son's first communion photo. Those photos meant so much to her; she saved each one she received from her family members and taped them to her wall at her assisted-living center. Probably the most important thing we can do to foster intergenerational relationships is to simply LISTEN to our elder family members, and not only when they are talking about family stories. Listen to them complain about sports teams or taxes or the government; sometimes, people just need their thoughts to be heard. You'll find that the more you listen to people, the more comfortable they will become with you as a conversation partner and the more willing they will be share old family stories and memories with you. Modeling good listening behavior is also really great for helping young children learning the basics of polite and rational conversation, which is a skill they will use the rest of their lives. You might have parents and grandparents who are super-duper family history curators, and if that's the case, this point may not apply to you as much, because there are already people in your family who are doing their best to preserve family ephemera for future generations. BUT, you might have family members who just have boxes of what they deem as 'old stuff' in their attic or crawl space - maybe some old photo albums, china sets, military memorabilia, family legal papers, etc. They may have intentions of 'someday' going through that stuff, or they may just be leaving it for younger generations to deal with when they pass away. Ask them NOW if you can go through it, organize it, and maybe even re-store it in better & safer archival containers. Also, doing so now, before the older generations pass on, allows you to ask your older family members who things belonged to, where they were made or came from, and who are in the photos, all information that is super-important to preserving family history. Digitizing photos and other family documents is an easy way for a busy mom to contribute to saving family history. Scanning photos is simple, doesn't require a ton of mental focus, and can be done gradually in small pockets of time. So, if you get discouraged that you don't have the time or energy to actively researching your family history, think about just getting some photos scanned and eventually that will all add up to a great accomplishment for your family history records. It's never too early to start talking with your small children about their family history. Talking to babies right from birth is SO important to their brain development. I always struggled with this when my kids were babies. I would read to them a lot, but the 'baby talk' never came naturally to me. Now, I realize I should have just told stories about my memories of growing up and people I knew from the past, like my grandparents. Turns out that talking about anything is good for baby. And, of course, continue telling those stories to toddlers, preschoolers, and school-aged children. As a child gets older, make the stories longer and more detailed. Pretty soon, the kids will be telling the stories on their own to younger siblings or cousins. Visiting cemeteries with young children is a great way to 'introduce' them to their ancestors. It's great exercise and it teaches children not to be afraid of cemeteries, an unfortunate and misguided viewpoint they might pick up from books and/or movies. While at the cemetery, model good and safe cemetery etiquette and even bring a little rag along so your toddler can help you 'clean' off your relatives' graves. Make going to the cemetery a regular occurrence for your children. Let the little ones touch and hold items that have been passed down through your family. Young children are such tactile learners; if they can associate an object with a story and an ancestor's name and photo, they will connect with that story SO much better than if you just tell the story alone. Of course, I have many more ideas for helping even the youngest kids connect with their family history and they can all be found on the ACTIVITIES page. I hope that mothers of young children have found at least some of these tips helpful, and I hope they can now see that you don't need to devote hours of time to pure genealogy research in order to have a large impact on the preservation of your family's history. You are living your future family members' history RIGHT NOW and you can make large strides in small ways to keeping your family history alive. The 100th anniversary of Armistice Day is nearly here, and a lot of nations and communities are commemorating the end of World War I and honoring the fallen in different ways - ceremonies, moments of silence, new statues and/or memorial sites, etc. On our own smaller scale, it's important to take the time to remember our family members who served in World War I - those who gave their lives for their countries and also those who survived, but had to live with the memories and other adverse effects of the war for the rest of their lives. War was, unfortunately, a very real part of many of our ancestors' lives, and influenced their lives in sometimes very profound ways. So, in order to help our kids understand our ancestors, we can't skip the discussion of war when we are talking about their lives, even though it IS a difficult topic to have with children. My WWI veteran ancestor was Luigi Licciardi and he fought in the Italian Army during the War. We don't know much about his service, but by 1920 he was on a ship to America, with his wife and young daughters to follow in 1921. Had he always wanted to come to America, or did his experiences during the war push him to start a new life somewhere far from the destruction and chaos in Europe? Enough Italian WWI veterans came to Cleveland, at least, that they started a social group/fraternal group known as Ex-Combattenti Italiani (Italian War Veterans), so perhaps that experience of serving and living through WWI did affect more peoples' decisions to emigrate out of Europe. Does your family have any ancestors that immigrated to America immediately after WWI? My husband had a great-uncle, Edward Tumbush, who served in the American Expeditionary Forces (AEF) during the War. He was the grandchild of German immigrants who came from Northwest Germany. It's hard to think that he may have been fighting against some of his own cousins on the front lines. Unfortunately, a couple of my husband's ancestral towns in the Meuse department of Northeast France suffered damaged and enemy occupation during the war, as well. 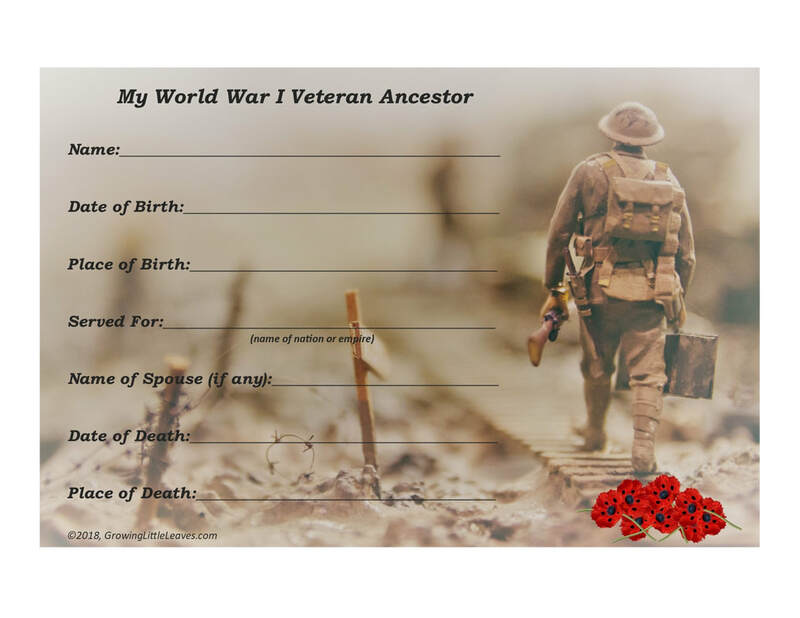 I've made two simple worksheets kids can use if they want to write down some basic facts about their ancestors who served in World War I. Click on each image to download a PDF. ​Several years ago, I made some poppy crafts with my daughter while we talked about the war and what the poppy symbolizes. You can find that post at this link. From the Rust Belt to RootsTech: A Winner! Congrats, Julia! Later today, I will send you a code that you can redeem for your free RootsTech registration. RootsTech Early-Bird pricing is STILL going on until October 12th, so head on over to RootsTech.org to register and lock in that $189 price for four days of awesome family history. Stay tuned for more information to come about RootsTech 2019! Yesterday, a friend posted an article on her Facebook page entitled, "I Check Into a Hotel Twice a Year By Myself and It's Made Me a Better Mom." There is a rising movement in the mom community to do trips away from home ALONE, as a form of self-care and rejuvenation. And whether a mom chooses to just catch up on sleep and watch Netflix for 48 hours, or focus on some other enjoyable physical or mental activity, we can all agree that moms need time like this to revitalize their spirits. For the past 4-5 years or so, I've been fortunate enough to take annual solo trips to various genealogy conferences and institutes. This is my ME time, this is when I focus on MY interests and goals, where I get to meet with other people for a reason other than being a parent. (No offense, PTAs, band parents, and kid-sports-team parents, but sometimes I need to step out of my parent role when it comes to adult conversation.) Attending genealogy conferences reminds me how much I love using my knowledge and intellect to better my family's knowledge of their incredible ancestors. The past couple of years, RootsTech especially has provided me with that yearly dose of enthusiastic inspiration I need to continue on when ancestors appear illusive in my research. Believe me, I know it's not easy logistically or financially to swing a solo mom trip. That $200+ conference fee + travel and lodging can be *really* hard for some families to manage. Fortunately, most genealogy conference dates and locations planned years in advance, so you have time to save for it little by little. In the past, I have specifically told my husband not to buy me birthday and anniversary presents, so we could put that little bit of extra money towards my trips. What about childcare? This is, in many ways, harder for some moms to arrange, both logistically and emotionally, than the financial aspects. That first time you leave your kids for an extended period, it's HARD! You feel like you're abandoning them, that they'll be lonely without you, that they'll resent you for going away. I've had all of these feelings, and they are completely normal. BUT, sometimes we let our loving-but-sometimes-irrational mom brains run away from reason; we always think the worst will happen. I've always hated asking for help when it comes to taking care of my kids, but, after several solo trips of my own, I've come around to the 'It takes a village' mindset. Kids are resilient, and though they may be sad while your gone, after a few days of doting on them, they are back to normal. And, as far as things going wrong while you are away, ask yourself how often things go wrong when you are there --- Yep, all the time, so it's ok if everything isn't perfect while you are away. Ask your partner or parent or trusted family friend if they'd be willing/able to watch your child(ren) for a few days. If they seem overwhelmed by this prospect, suggest a 'tag-team' situation in which two or more caregivers divide their time with the kids over the few days you'll be gone. Putting trust in others to care for your children will not only enhance your children's relationships with these caregivers, but it will also enhance YOUR relationship with those caregivers. It's a win-win in the long term. 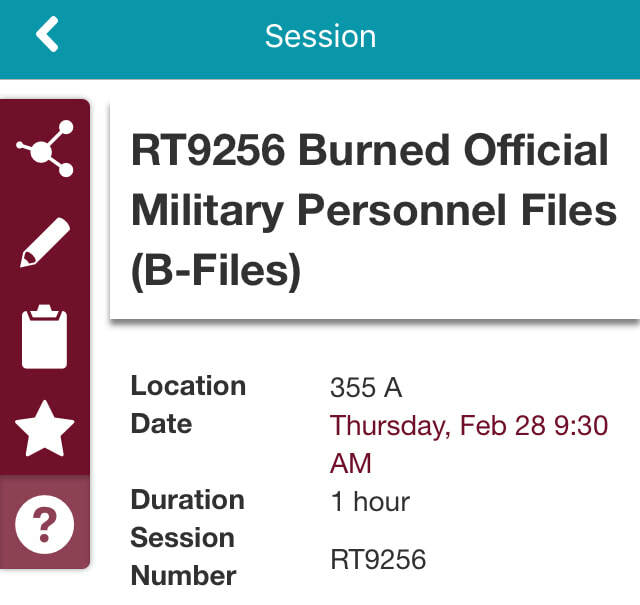 What if you'd like to attend RootsTech, still have an infant, and really don't want to be away from him or her for that long? I get it; bring the baby along. I can tell you that I've always seen at least a few baby moms walking through the convention center, pushing a stroller, nursing in a quiet corner of the exhibit hall. You probably won't be able to attend as many sessions as you could if you had no children with you, but even just attending a couple a day would be worth it. Even aside from Family Discovery Day (about which I will write a separate blog post), RootsTech is the MOST family-friendly genealogy conference I've ever experienced. Moms, have I convinced you yet? Trust me, it takes a lot of planning and some sacrifice, but attending a genealogy conference or institute on your own will make you a better family historian AND a better mom. Even though being a parent is the most important job in the world, you, as a person, also exist outside of that realm. We need to meet that person's needs and foster our own personal growth according to our own interests. Over the next couple of months, dozens of genealogy bloggers will be offering opportunities to win a free 4-day RootsTech pass, which is awesome and really helps make it financially easier to attend. Enter as many of these contests as you can find! Go to THIS LINK to enter my contest, which runs through October 1st. I will announce a winner on October 2. In future posts, I do plan on talking a little about Family Discovery Day, which I highly encourage attending with your family, especially if you are local and can't swing the solo trip this time around. I'm also going to highlight some of the presentations that I feel parents, especially, will find the most helpful when it comes to sharing family history and keeping it fun for all ages.